By learning how zebrafish regenerate their eye muscles, researchers could help figure out how to help humans do the same. University of Michigan Kellogg Eye Center (link is external) researchers have published findings in PLOS One (link is external) on the role of insulin-like growth factor (IGF) in promoting extraocular muscle repair and regeneration in zebrafish. If the process can be replicated in humans it stands to power new treatments for vision loss caused by strabismus (link is external), known as crossed eyes, and congenital ptosis (link is external), both common childhood eye diseases characterized by poorly developed eye muscles. Zebrafish have the unique ability to grow back damaged hearts or when they are blinded, regain the ability to see. They have become unlikely heroes in research labs around the world. Because zebrafish share 70 percent of humans’ genetic code, it’s often possible to use them to study human genetic traits and diseases. They are assisting Kellogg researchers in basic science to regenerate the eye (link is external). 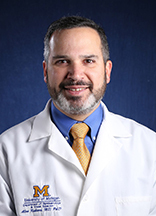 Alon Kahana, MD, PhD, an oculoplastic surgeon at U-M Kellogg Eye Center, studies the molecular mechanisms of eye muscle regeneration and the signals that regulate the regeneration process. For the lab study, Kahana and colleagues created a model of eye muscle dysfunction in zebrafish to study strabismus as well as congenital ptosis, the term used for droopy eyelids in children. With strabismus, eyeglasses, exercises, or patching can help straighten the eyes and restore binocular vision, but surgery is often needed to save vision and restore function, Kahana says. Kellogg authors make the case for IGF signaling as a key regulator of extraocular muscle re-growth and timing. IGF signaling is critical for reprogramming muscle cells in the late stages of extraocular muscle regeneration, according to the study, and in the lab blocking IGF signaling diminished muscle fiber growth. The next research step is to examine the activities of the signaling pathway, and learn if the role of IGF is shared in the same reparative pathways for other muscle tissue types.